Actor Noah Yap sentence to 9 months in DB. The actor best known for his role as I.P Man in Jack Neo’s military coming of age series, Ah Boys to Men is ironically in trouble with the military. Noah who was serving in SAF’s Music and Drama Company (MDC) was caught for cannabis consumption and will be serving a 9 month stint in Detention. Responding to media queries, the Defence Ministry confirmed that Yap was found guilty under Section 8(b)(ii) of the Misuse of Drugs Act. 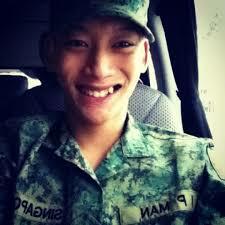 Yap was sentenced at the SAF Court Martial Centre. If found guilty, first-time offenders can be jailed between nine and 15 months. Repeat offenders can be jailed and caned. Jack Neo had personally warned the cast members about dabbling ind rugs and getting not he wrong side of the law. But it looks like this Ah Boy will stay an NSF a longer time than originally thought. » Simi Flying Spaghetti Monster?